If you are indeed looking for a party bus in Ypsilanti, then you will be pleased to hear that your search is now finally over. At Rockstarz Limousine and Party Bus, we specialize in not only providing our clients with the best service possible, but we also know what it takes to give you the most amazing party that you have ever attended. To rent a party bus, you will also want to know how many guests you can invite along because often number limits is a problem. However, we have taken active steps to make the best use of the space available on our bus to allow you to invite even more people than ever before to join you in your celebrations. Our Ypsilanti party bus rental option is intended to provide you with an experience resembling your very own private nightclub. From the very moment you board, you will discover that you are going to be cruising around town in a cool location while you have an out of this world party along with all of your guests. From the sound system blasting out your music to the laser light show that is designed to add an extra bit of atmosphere, this is one party bus that stands out above all others. After all, you want your party to be special, so why not have a special location? 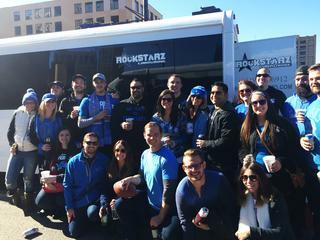 Previously, our Ypsilanti party bus service has been used for a range of celebrations. No matter if you are looking for a birthday, anniversary, or perhaps even just a place to hang out that is different from your normal places, we can help. So, if you do live in the Ypsilanti area and are looking for a party bus, then give us a call here at Rockstarz Limousine and Party Bus. Alternatively, you can contact us via our website and someone will be in touch as soon as possible to discuss your own individual requirements.